Hello friends, I hope you all are doing great. In today’s tutorial, we are gonna have a look at detailed Introduction to TCS3200. 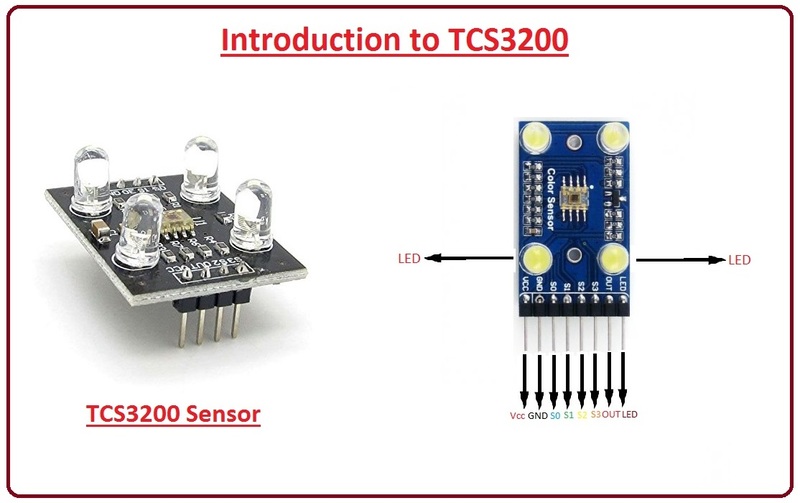 TCS3200 is a color detecting sensor, it consists of TAOS TCS3200 RGB sensor chip and four white LEDs. It is used to detect visible color in a measurable range. This sensor has an array of a photodetector diode, some diodes are equipped with different color filters i.e. red, blue or green color and some diodes do not have any filter. TCS3200 have different applications such as test strip reading, sorting by color and ambient light sensing. In today’s post, we will have a look at its working, protocol, pinout, specification, etc. I will also share some links where I have interfaced it with other microcontrollers. If you have any question about it ask in comments I will resolve your problems. So, let’s get started with a basic Introduction to TCS3200. TCS3200 is a color detecting sensor, it consists of TAOS TCS3200 RGB sensor chip and four white LEDs. It is used to detect visible color in a measurable range. It is a programmable sensor and color light to frequency converter. The board of this sensor is a monolithic integrated circuit which consists of configurable silicon photodiode and a current to frequency converter. The output of this sensor is a square wave (50% duty cycle), the frequency of output depends on the intensity of light (irradiance). An output frequency of this sensor can be scaled by two input control pinouts. Due to its digital input and digital output, it can easily be interfaced with other microcontrollers. The light to frequency converter of this sensor reads the 8 x 8 array of photodiodes. In this array of photodiodes, 16 photodiodes have green filters, 16 has blue filters, 16 has red filters and sixteen photodiodes have no filters. To minimize, the effect of non-uniformity of incident radiation all photodiodes are interdigitated. Same colored diodes are connected in parallel. We can use pin S2 and S3 to check which group of photo-diodes is active. The dimensions of photodiodes are 110um x 110um. Operating temperature of this sensor is -40°C to +85°C and it is available in 8-SOIC packages. This sensor is mostly used in RGB led industrial control projects and medical diagnostic types of equipment. 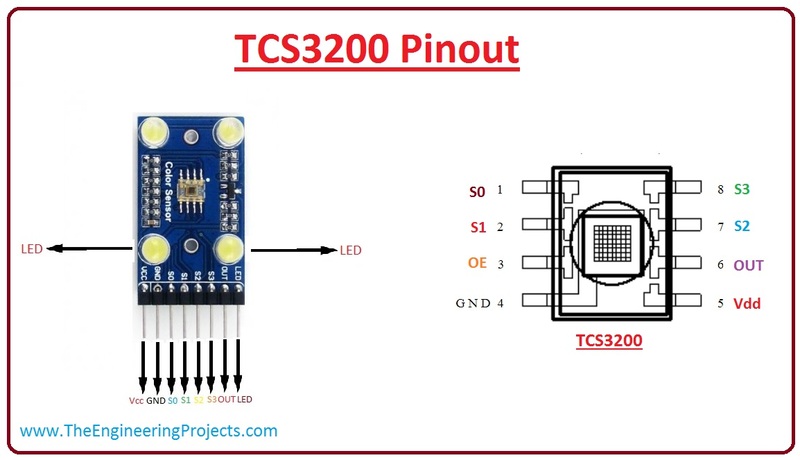 Noe, we discuss TCS3200 pinouts with a detailed description. There are main eight pinouts of TCS3200 which are described below. Pin#4 GND This pin is the power supply ground. All voltages are reference to the ground. Pin#5 VCC It is a supply voltage. Pin#3 OE Enable for FO (Active low). Pin#6 OUT This pin is for output frequency (fo). Pin#1,2 S0, S1 Using these pins we can Select lines for output frequency scaling. Pin#7,8 S2, S3 Using these pins we can Select lines for photodiode type. Now, we discuss the specifications of TCS3200, which are described below. These are the main features of TCS3200. Its operating voltage is 2.7v to 5.5v. Its operating current is 2 mA at 5 V.
Its interface is digital TTL. It can easily convert light intensity to frequency with high resolution. There is no need for ADC. It operating temperature is -40 C to 85 C.
It has a power down attribute. It is available in a 5mm x 6.2mm SOIC (D) package. It supports LED lamp light supplement control. As we have already seen that TCS3200 has an 8 x 8 array of photodiodes, which are used for color sensing. When light falls on these photodiodes, then these light signals are converted into square waves and the frequency of these square waves is dependent on the intensity of falling light. After getting results from light to frequency converter, which is a square wave, we can simply fed them to any microcontroller like Arduino, PIC Microcontroller or Atmel etc and detect the color of falling light. If we observe a given diagram we can easily understand how the sensor can detect various colors. As we earlier discussed that photodiodes of the sensor have three different filters which are red, green, and blue while one group of photodiodes have no filter. All sixteen photodiodes of a sensor are connected in parallel, by using two pins S2 and S3 we can select which pin we have to use for color reading. Let’s suppose we have to detect red color, we just have to use sixteen red filter photodiodes by setting two pin S2 and S3 to low logic level according to a given table. TCS3200 also has two more pins used for controlling purposes, and are named as S0, and S1. These two switches are used for tuning the frequency of square wave. We can set the output frequency to either 2%, 20% or 100%. These are builtin frequency values. This function tells us that we can optimize the sensor output for various counters and microcontrollers. These are some applications of TCS3200. 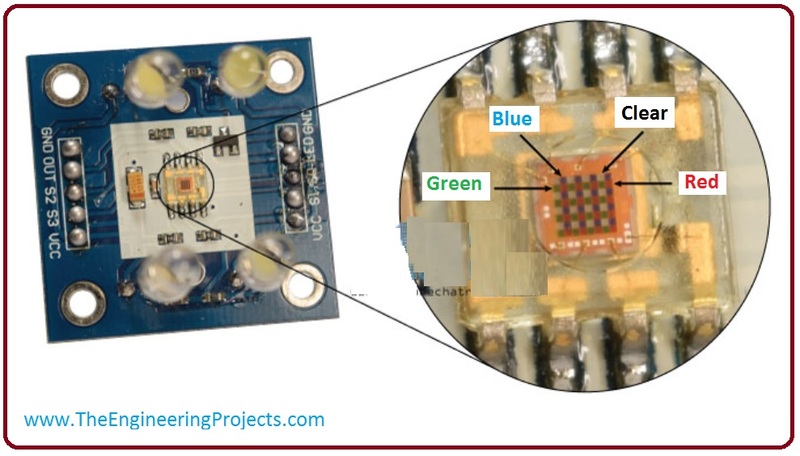 As we know this is a color light sensor, so we use it in color detecting projects, otherwise we have to use MATLAB for color detection, which will need laptop (not a good option). We can also sense ambient light using this sensor. We can also read color codes on LED strips. So, friends that were all about TCS3200 If you have any questions about it please ask in comments. Thanks for reading. Take care until the next tutorial. Thank you for this amazing introduction. I’m working on a project that uses this sensor but I’m facing a problem that this sensor has no model in Proteus, so I can’t simulate the code that I wrote. I’ve searched for a library of the sensor and never found any. Any help, please ? ?